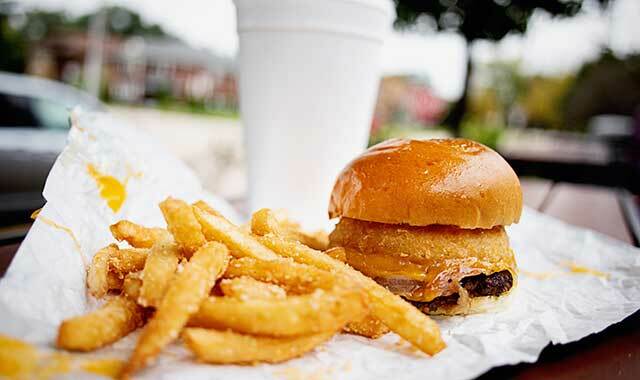 Great burgers are everywhere, and they’re especially rewarding when found well off the beaten path. Check out seven places well off the radar that are producing some of the best burgers you’ve never heard of. Fancy restaurants are nice, but neighborhood “dives” across our region are some of the best places to grab a classic, juicy burger made how you want it. • The Mackaveli: Named after the famous West Coast rapper Tupac Shakur, this burger is a staple at 15th and Chris in Rockford. It’s their version of a western burger, topped with barbecue sauce, melted cheddar cheese, bacon and beer-battered onion rings. It pairs well with a blue-raspberry milkshake. • The Chana Burger: If you blink, you might miss Chana Tap, a small burger joint in Chana, Ill. Order this burger with either a half- or quarter-pound of fresh beef, topped with tomatoes, lettuce and onion. Bacon and cheese can be added for a small fee. • Steak Burger: Separating itself from standard pub food, Crazy Times Pub & Grub in Machesney Park, Ill., takes pride in using the finest and freshest ingredients, resulting in a quality burger. The steak burger, one of the more popular options, can be ordered plain or seasoned like the regular steaks on the menu. Order it with garlic or spice it up with condiments like pepper jack cheese, cayenne pepper and jalapeños. • Western Burger Combo: This burger is a favorite among guests at Buddy’s Burgers in Rockford. It comes with two sizzling burger patties, American cheese, onion rings, barbecue sauce and bacon. • The Big Poop: This large burger, found at Poopy’s Pub n’ Grub – a biker-friendly tavern in Savanna, Ill. – weighs in at one pound. You can also order the two-pound double poop or try your luck with the whopping triple poop burger, made with three pounds of beef. Top it off with an array of toppings, including mushrooms, jalapenos, grilled onions and bacon. Best of luck! • Build-Your-Own-Burger: Start with a quarter-pound of a ground chuck and brisket-blended patty and then, you’re on your own. Pile your burger high with lettuce, tomato, onions, pickles and mayo. For a small fee, add bacon, mushrooms, grilled onions and cole slaw, among other classic burger toppings at The Hunt Club in Oregon. • The Famous Ridott Burger: Located on U.S Route 20 between Freeport and Rockford, Ridott Corners Tavern is known by locals for one thing: burgers. At this place, you start with a thick patty and build the rest to your liking. This establishment is also convenient for travelers – you can get your food and jump right back on the highway. This entry was posted on Tuesday, October 23rd, 2018 at 12:00 pm	and is filed under Dining Guide, Top Posts. You can follow any responses to this entry through the RSS 2.0 feed. Both comments and pings are currently closed.